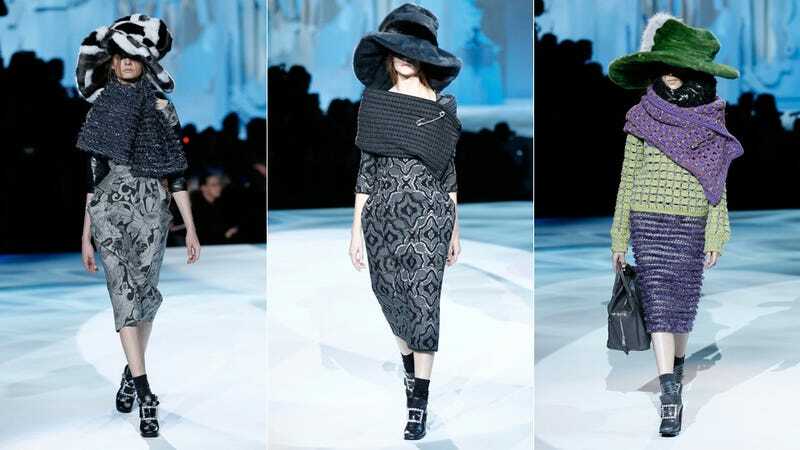 Marc Jacobs sent out a fall collection last night that just dared you to call it ugly. Dr. Seuss hats? Check. Oversized grandma shawls, secured with oversized kilt pins? Check. The confounding audacity to flout fashion week's age guidelines by hiring two 14-year-old models, even while claiming backstage after the show that the decidedly grown-up blog Advanced Style had been an inspiration? Check. What to make of it all? There were references to pilgrims — albeit pilgrims with rhinestones on the buckles of their shoes. There was giant paisley. There were tiny furry appliqués. There was quilted leather. There was the sculptor Rachel Feinstein, doing the set. I so look forward to seeing one of these head-to-toe runway looks against a greige background in Vogue. Other designers have done bag-lady eclecticism before — hello, Comme you hear me? — but Jacobs presented it here with a lot of wit — even if you couldn't tell if the joke was on us. The fashion writer Lynn Yaeger, the artist Cindy Sherman, and the editor Anna Piaggi were said to be influences. But the supposed nod towards older women rang hollow, especially given the super-young casting: in truth, only the very young can get away with dressing like grandma. The middle-aged customer may not want to dress like a girl (and I, for one, have always found certain designers' obsession with the jejune and cutesy somewhat troubling on a political level), but she certainly does not want to dress like a pensioner, either. But, like, seriously: is he doing this just because he can? Or did Marc have a dream a few months back where all the women were wearing enormous skirts over black capri pants? Is he just messing with us? Some prominent critics are raving. "It was fearless, just like Piaggi, Yaeger, and co. And it made you fall in love with fashion and Marc Jacobs all over again," raved Nicole Phelps. But at the Times, Cathy Horyn filed a 200 descriptive words without quite having to express an opinion. In other 'Huh' moments, let me leave you with this: Francine Prose was at the after-party. Hmmmmmmm.